Feeling a little lazy today. Good thing I've got free chicken curry. All I need to do is to boil rice, heat up chicken curry in rice cooker (once rice is cook) and cook a bowl or plate of vegetables. I swear I almost made a bowl of carrots and cucumber salad (achar). 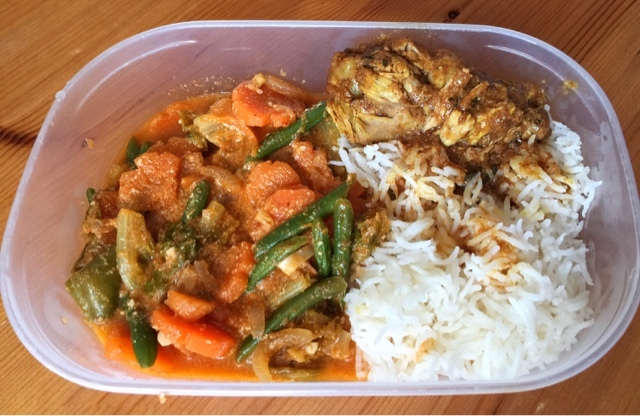 It's one of the easiest vegetable meal to prepare- and it suits the whole chicken curry and rice combination. Then I thought... I better start "digging in" vegetable box compartment to see whichever vegetable I might have forgotten. That's where I decided to do something with 1/3 packet of fine French bean and abandoned romaine salad. It's not the best tasting curry but it's relatively healthy and decent enough to go with the chicken curry and rice.